THE CHUCK WAGON: Lay long planks across 2 sawhorses. For the canopy at the end, secure 3 heavy wires or hoops, about 1 ft. apart, over the planks; cover with burlap. Cut out 4 wheels (optional) from single large sheets of cardboard (or from stapled smaller sheets) ; attach them to sawhorses, with large corks for hubs. THE SETUP: On planks, arrange, for help-yourself service, a pile of tin pie plates, salt and pepper shakers, and inexpensive forks, knives, and spoons as shown opposite. Hang tin cups alongside the planks. For napkins, use red bandanas. For the centerpiece, fill a catchup bottle with field flowers. Red lanterns provide light. SCENERY: For seats, use empty nail kegs (from a hardware supply house) ; top each with a round brown cushion. For added Western flavor, on squares of colored paper, draw brands (like those shown opposite) ; tack them up on trees, a fence, etc. OLD WEST FAVORS: Provide each cowboy and cowgirl with a neckerchief or a horseshoe-shaped magnet. STEER-ROPIN’ contest: On a piece of plywood or scrap lumber, paint the head of a long-horned steer. Pound several spikes into the horns. Each contestant has 3 tries to rope the steer with rope quoits or a lariat. At partytime, divide guests into 2 teams—Good Guys and Bad Guys. At a signal, the first player on each team races through the obstacle course and back to the starting line, where he touches the next player, who then does the same, etc., until all players have participated. STAGECOACH: Before the party, write a wild-West story depicting the holdup of a stagecoach. Mention these characters frequently: cowboy, young lady schoolteacher, driver, guard, sheriff, outlaw, etc. At partytime, appoint one child to be the narrator, and the other children to act the characters in the story. The children sit on the nail kegs, and the narrator reads the story aloud. As each character is mentioned, the child who represents that character runs around his nail keg and sits down again. Whenever the narrator says, “stagecoach,” the children change places; in the confusion, the narrator tries to get one of the other places. If he succeeds, he becomes one of the characters and the player who lost his place becomes narrator. SHOOTIN’ CONTEST: Tack a target up on a fence. Let each player have 3 shots at it with a toy gun that shoots harmless, yet accurate, cork pellets. 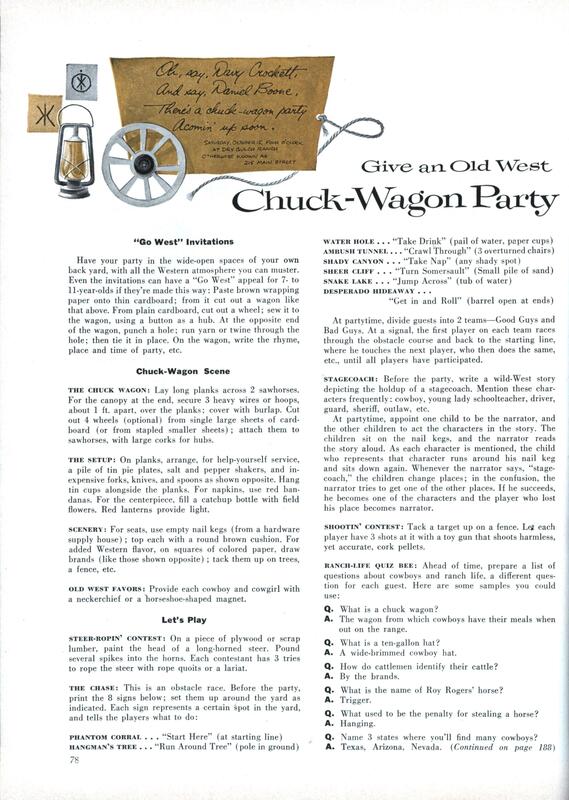 Q- What is a chuck wagon? A. The wagon from which cowboys have their meals when out on the range. Q. What is a ten-gallon hat? A. A wide-brimmed cowboy hat. Q. How do cattlemen identify their cattle? Q. What is the name of Roy Rogers’ horse? Q. What used to be the penalty for stealing a horse? Q. Name 3 states where you’ll find many cowboys? At partytime, divide guests into 2 teams; have them sit on the ground, facing each other. Ask questions first of one team, then the other. When a player fails to answer correctly, he drops out. Throughout the party’s games, give cowboys and cowgirls points instead of prizes—5 points for being first, 4 for second, 3 for third, and 2 for each member of a winning team. At the end of the afternoon, the grand winner receives a miniature chuck-wagon set, complete with campers’ eating and cooking equipment. In it there’s also a cook book, as well as small cans of pork and beans, spaghetti, and soup. And for real Western atmosphere, there’s even a phonograph record of Western tunes, plus 2 neckerchiefs. By all means, cook the “chow” outdoors —over an open fire or on a grill. Or cook it indoors and serve it outdoors. Doggies in Toasted Buns (he-man hamburgers). Little Tex Sauce (heated catchup). 1. Cook 1 pkg. frozen corn. Cook 2 pkg. frozen, or 1 lb. fresh, green beans; or heat 2 cans Blue Lake green beans. 2. Meanwhile, heat 1 1-lb. can baked beans (Boston style or in tomato sauce) with 1-1/2 teasp. seasoned salt, 3 tablesp. butter or margarine, 1/2 teasp. Worcestershire. Add 1/2 teasp. monosodium glutamate. 3. Toss baked beans with drained cooked corn and green beans. Makes 6 servings. 1. Use 1 round 1/2-gal. carton coffee or vanilla ice cream. 2. Cut out paper stencil of wagon wheel to fit top of ice-cream carton. Lay stencil on ice cream. 3. Sift cocoa from tea strainer over stencil; carefully lift off stencil. 4. Serve ice cream right from carton. 1. Prepare and bake 1 pkg. favorite cake mix as label directs, making 2 9″ layers. Cool as directed. 2. Start heating oven to 350° F. Grease well a 10″ x 6″ x 2″ oblong pan. 3. Prepare second package of cake mix as label directs; turn into oblong pan. Bake about 35 min., or until cake tester inserted in center comes out clean. Cool as directed. 2. Place 14″ x 12″ oblong wooden board or foil-covered cardboard (or large round plate) so that short end faces you. On board, set filled layer, with rounded side near end of board away from you. 3. Set oblong cake on board, with long side against cut sides of layer. Glue with frosting. 4. Starting at ends of inner arc of layer, with knife, cut down through oblong cake to form horseshoe shape. Remove center piece of cake from oblong (save for a later dessert). 5. Now, where inner arc of layer joins oblong cake, whittle off some cake to widen arc. Also whittle cake into horseshoe shape 2″ up from both ends. 6. Cut reserved 3″ circle of layer cake in half vertically. Set one half on top of the other, with frosting as filling; halve vertically. With frosting, glue a straight cut side of each half to outside of each end of horseshoe, forming straight line at bottom. 7. Using Range Frosting below, generously frost sides, then top, of cake, keeping horseshoe shape. Refrigerate. 8. To serve, set cowboy, Indian figures, and birthday candles on and around cake as shown. 1. In small saucepan, heat 2 cups dark corn syrup till boiling. 2. With electric mixer or egg beater, beat 3 egg whites until they form soft peaks when beater is raised. 3. Add pinch of salt. Then slowly pour in corn syrup, continuing to beat until frosting is fluffy and forms peaks when beater is raised. Fold in teasp. vanilla extract. Use any leftover frosting to frost reserved cakes. MSG is the bomb, baby … if you’re not allergic to it. I sit here sadly wondering if most kids today would even know what a chuck wagon is. M.S.G. MonoSodium Glutamate. I believe “Lawrey’s seaoning salt” was loaded with MSG at one time. It still might be, but they might call it “Natural flavor” now. 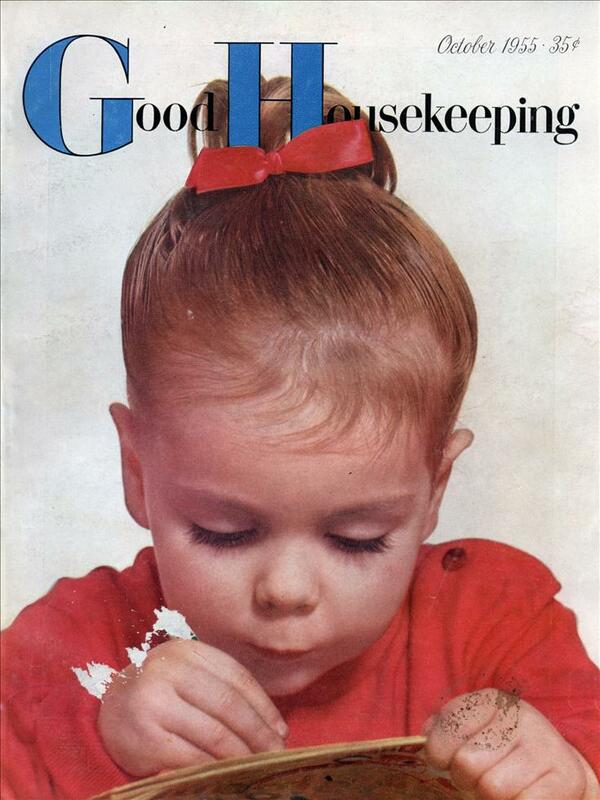 Those recipes are so typically Fifties – canned and frozen foods, cake mixes, nothing completely from scratch. Fresh ingredients were okay in their place, the prevailing belief went, but nothing said modern, progressive, and upwardly mobile like ingredients from the canned and frozen food aisles. “Accent” was the brand of MSG I remember most. Mmmm.